This unusual car, or what's left of it is sitting in a lot behind the mining museum in Eureka, Utah along with other rusty remnants of Eureka's mining past. Luckily someone had written on the cowl what the make is. I'm a car guy but I don't believe I'd ever heard of a Mitchell, I would have never figured that out on my own! The year of manufacture is 1918. 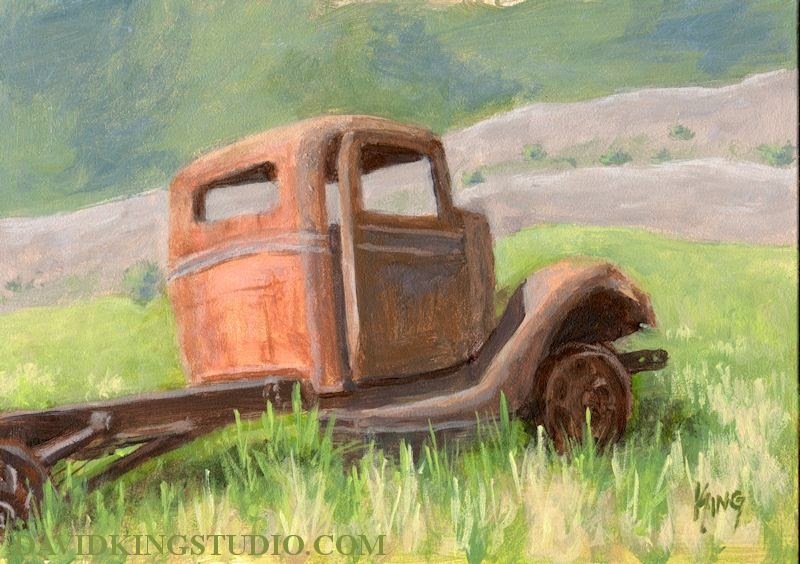 Another rusty truck painting, at least this isn't a Ford Motor Co. product but rather a 1937 Chevy. The painting is based on a photo I took at a small local collection that's on public display. Apparently I've been the victim of a Blogspot glitch. 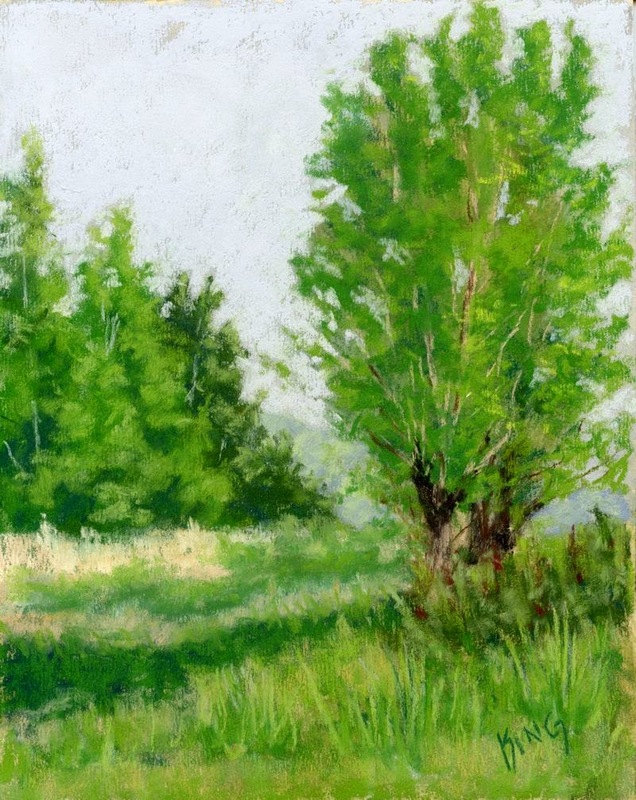 I posted a long post yesterday about plein air painting at the Jordan River Parkway on Saturday but it's disappeared, so now you get a shortened version, I just don't feel like typing that whole post again. 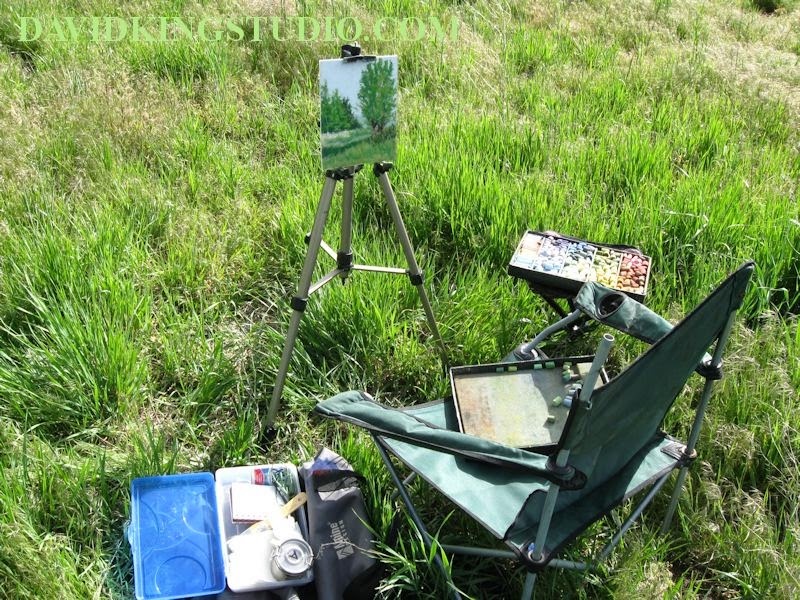 "One Fine Spring Day Study"
If you have any questions about my setup leave a comment and ask there. I don't know what attracts me to these rural scenes. I really enjoy exploring the back roads of the state looking for old sheds, barns and farm scenes. However, I really don't have much personal connection to farming. 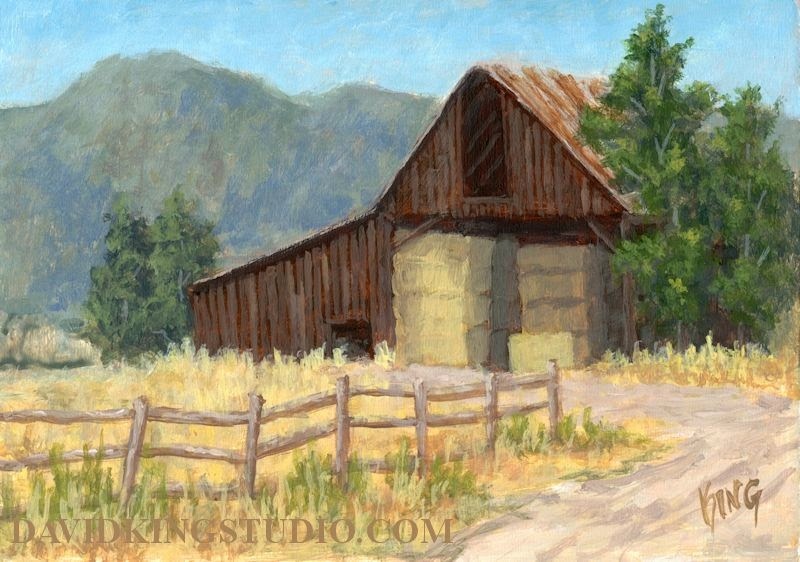 My grandfather on my Mom's side did have what was essentially a small farm with a very large garden and a corral that he kept everything from sheep to bulls in and of course he had a couple small out buildings to store hay and tools in, it was basically a micro farm but it wasn't his livelihood. I did spend quite a bit of time at my grandparents house, most of my life I lived close by, even within walking distance for the first 11 years of my life, however as a kid the farming stuff didn't really attract me so I have to confess I didn't get my hands dirty much on my grandparents farm. I also had a great aunt and uncle on my Dad's side that had a real working farm in a small town just 20 minutes from where I live now. Up into my late teens my Dad would pick up my brother and I at least once a year for a trip to Aunt Louis' and Uncle Harry's. Their house was very old, I suspect dating back to the 1930's or earlier. They'd give my brother and I toys to play with, cast iron and pressed steel toys from the 50's, none of that plastic crap! These were real "salt of the earth" people from the "Greatest Generation, (as was my Grandfather). Of course as a kid I didn't really appreciate the experience, in fact I often dreaded the visit and don't recall ever going out behind the house to see the farm. I regret having that attitude, I'm sure I missed having some special experiences the memories of which I'd cherish now. Maybe I'm attracted to these scenes due to that regret, trying to capture what I didn't take advantage of in my youth. I've been a bit lazy lately but not totally delinquent. I did manage to get out and sketch last Saturday. I managed to wander over a good portion of the east side of the Salt Lake Valley but ended up at a small nature preserve in the heart of the commercial district of Sugarhouse called "Hidden Hollow". It really is kind of hidden, I didn't know it even existed until I heard about it on the radio a couple years ago. Everything has just sprouted leaves so it was almost as green as a jungle in there, I found this neat little composition and just had to sketch it. That's Parley's creek that's running through the middle. I simplified the bridge a bit. The city of Sugarhouse gets it's name from the sugar beet mill that was built here not too long after the valley was settled and was actually built in approximately this spot, in fact I believe some of the concrete and rock walls I saw lining the creek may have been part of the old sugar mill, I even included just a bit of one of them in the sketch in the lower left. 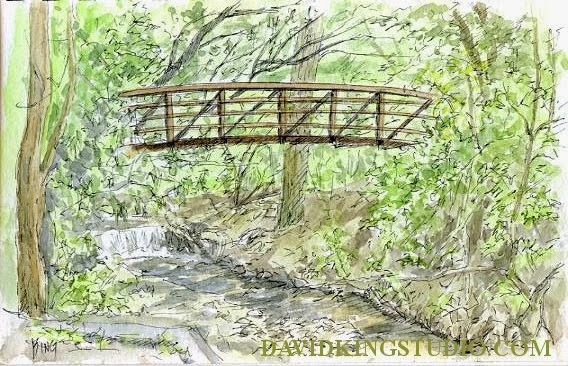 There are many interesting things worth sketching in Hidden Hollow, I'm sure I'll return. Another small painting of a rusty subject. 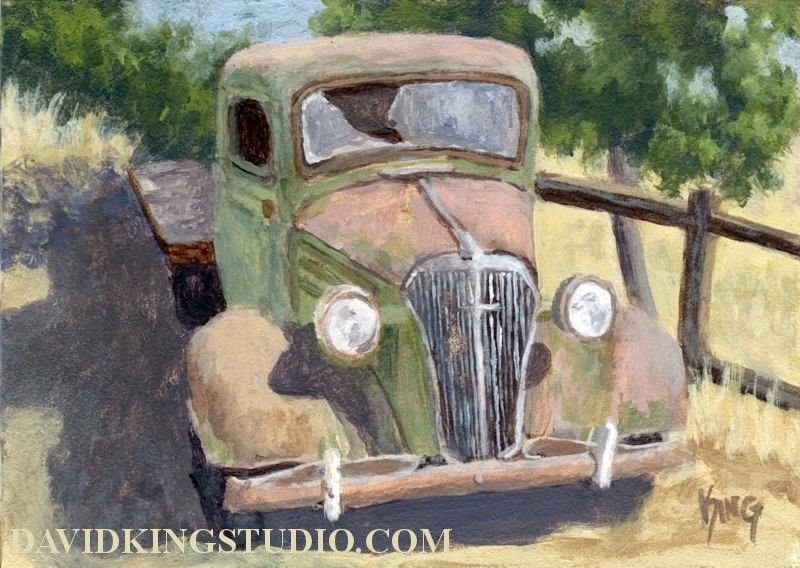 This time a late 30's Ford heavy duty truck, at least what's left of it. The reference photo was also taken at the Antique Power Show. There were a couple other trucks in similar condition in a row with this one as well as other junk piled around. I left out the other trucks and junk and abstracted the background somewhat and this is what I ended up with. 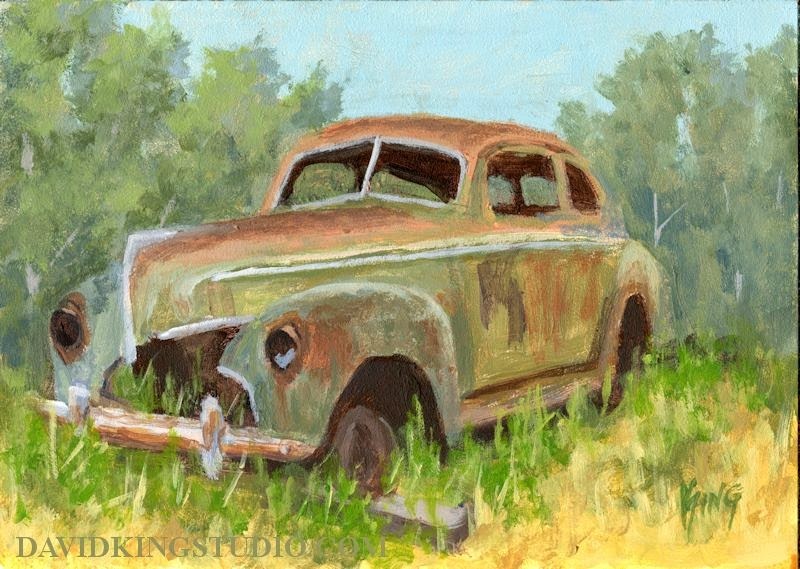 I took a bit of a break, now I'm back and with another small derelict vehicle painting. 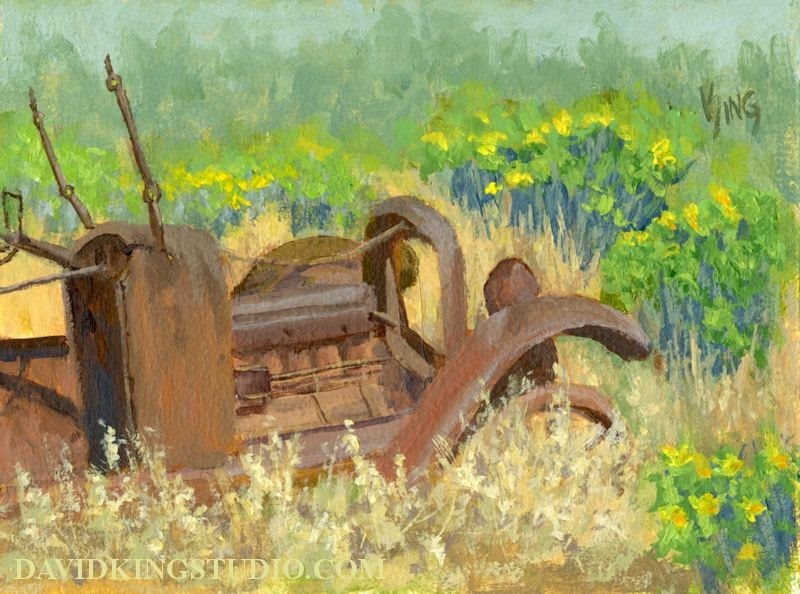 This painting is based on a photo I took at the Antique Power Show held at the Erickson Ranch every year in Wallsburg, Utah. The background in the painting is totally invented. In the real scene a Model A Ford truck and other junk are in the background. What car nut wouldn't love to come across an abandoned 1940 Mercury in the woods and drag it home to restore it?